Sweets are part of our traditional customs to celebrate any kind of events. Be it a festival or any other occasion, sweets are religiously part of the cuisine. Indian sweets are definitely not the time to think of calories. Made in what is typically called, ‘the desi ghee’, most of our Indian sweets are just delicious to not get satisfied with just a little. With the best collection of authentic sweet makers, we bring to you the best ever tasting sweets from the finest confectionery at your door. All kinds of sweets finely packed are freshly available for your delivery. Be it the high calorie Kaju katli and Kaju barfi or the traditionally fried motichoor and boondi laddoo or the mouth-watering gulab jamun and rasgulla, or the sweets named after the districts themselves Dharwad pedha and Belagavi Kunda or varied kinds of barfis and pedhas made from the finest quality khowa, we have them all for instant online delivery of valentine sweets in Davanagere for your loved ones. To those who wish to savor their sweet tooth with an amazing treat, you are at the right place. This season which is totally dedicated for the loved ones, surprise your beloved people with the finest dessert of our traditional country which can never be replaced with any other western cultured desserts like cakes, shakes, ice-creams, and chocolates. This celebration which is due to the western influence shall definitely be more thrilling and fantastic with our ritualistic approach. 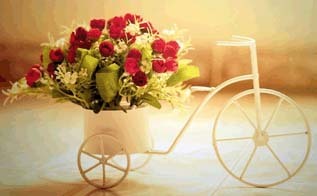 The conventional means of approaching your loved one with a beautiful set of fresh flowers filled with amazing fragrance along with a wholesome pack of sweets which are authentically made just for the occasion shall definitely mesmerize him or her and shall leave an everlasting lovely impression throughout the year. We strive to help with best options available with us for the valentines season that is fast approaching. We have put in all our efforts to bring the best and send valentine gifts online in Davanagere.